In 1903, the Electric Railway Improvement Company (nVent ERICO) was created to supply power bonds, signal bonds and related welding equipment to railroads, mining and street railway industries. And for the next 112 years, the company expanded and flourished by adding capabilities and brands relevant to their core business as well as by promoting growth with forays into some new business arenas. In 2015, nVent ERICO Global Company became part of the Pentair family. Today, Pentair Engineered Electrical & Fastening Solutions is a leading global manufacturer and marketer of superior engineered products for niche electrical, mechanical and concrete applications. 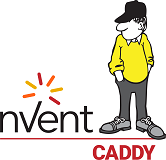 The fixing, fastening and support products are all part the nVent CADDY brand. The nVent CADDY CAT HP System is a cost-effective alternative to using wire mesh cable tray, ladder tray or similar complex alternatives. It requires significantly less material and installs in a fraction of the time of other methods. This versatile solution accommodates a wide range of attachment methods and is available as individual J-Hooks, pre-built nVent CADDY CAT HP assemblies and multi-tiered trees, as well as interchangeable nVent CADDY CAT HP components. The nVent CADDY CAT HP J-Hook System provides the perfect combination of performance, time savings and versatility required by today’s datacom and electrical contractors. nVent CADDY’S innovative products such as Rod Lock, SN SERIES NUT, and SPEED LINK save the contractor money by significantly reducing installation time. Why nVent CADDY CAT HP?